One way to feel more connected to your faith community is to participate in the national meeting that is called General Assembly. UUFE gets to send 2 delegates who may vote on matters covered during the plenary sessions, including Actions of Immediate Witness and Statements of Conscience. Our annual General Assembly moves around the country and has grown to include other events like the Opening Ceremony and Banner Parade, the Ware Lecture, a special service regarding our ministry called Service of the Living Tradition, a national Bridging Ceremony for people transitioning from youth to young adult (18 year olds), and workshops for church life or personal interest. Not everybody can get to GA. Travel and lodging can be expensive and registration is not free, whether you simply attend or go as a delegate, but this year we are blessed to make the experience more accessible. Its physical location is Kansas City, Missouri, but due to a generous anonymous donation, we can register 2 delegates, pay the offsite registration fees, and empower them with all of the duty, responsibility, and pleasure of participation in plenary sessions without going to Missouri. Everything happens by computer, and with Rev. Amy “attending” offsite as well, she and delegates can decide to stay at our own houses or meet together at UUFE or elsewhere. The time requirements and instructions are listed on page 5. 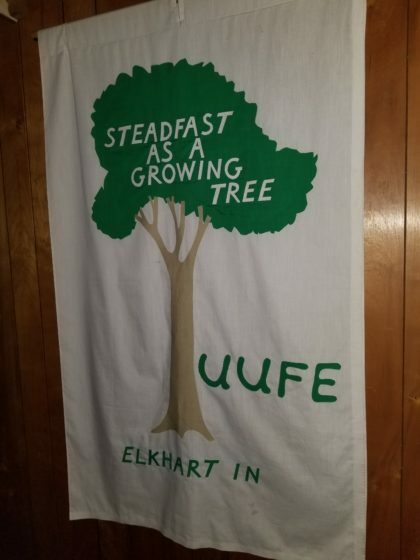 Serve your faith and UUFE as a delegate, right in Elkhart.